The PilotPress plugin adds powerful membership functions to WordPress. By default, customers are redirected to a single page after login. To redirect customers to different pages depending on their membership level, Shortcodes provided by PilotPress can be used on that page. The customers land on the page initially, and are immediately redirected to the page you specify in the Shortcode. Shortcodes in WordPress are capable of functionality beyond showing and hiding content on a page. One advanced use is creating a redirect Landing Page for all customers. Create the various membership pages for each membership level in WordPress. In this example we’ll use Bronze, Silver and Gold membership levels. Copy the URLs for each of these WordPress pages to a text file for use later. In this example, we’ll use "http://your-domain.com/bronze", "http://your-domain.com/silver" and "http://your-domain.com/gold"
Create the initial Landing Page that will redirect your members based on their membership level. For this example, it is named “Welcome!” and is at "http://your-domain.com/welcome"
On the “Welcome!” page, insert the shortcodes to redirect the customers based on membership level. 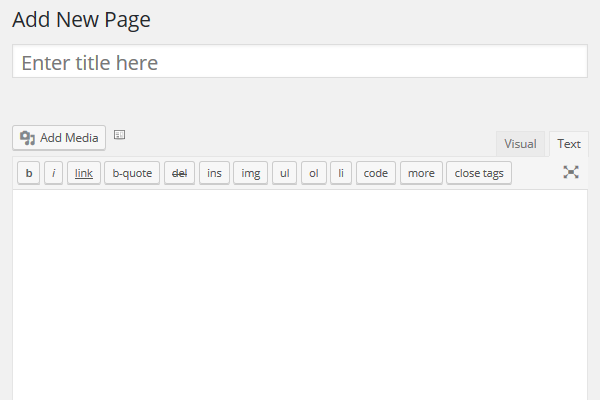 Use the Text tab in the WordPress editor to insert the shortcodes because of the raw HTML you will be entering. The Text tab is on the right in the image below. Customer redirect settings in PilotPress can be accessed by going to Settings menu > PilotPress > Customers Redirect To. Change the setting to your "Welcome!" page and click "Save Changes". Log in as your new contact and verify the shortcode redirection. You must use a private browsing window and clear your site's cookies in order to log in with a Contact's login credentials. Check with Support if you believe you have a conflict with another plugin. The World Wide Web Consortium (W3C) recommends against using the HTML <meta> http-equiv Attribute as it can disorient users who expect to land on a certain page. In our usecase, you are redirecting the customer to an expected page. Because we are doing an immediate redirect, the “back” button on your customer’s browser may not work as expected. When they click “back” the page will appear to not change, when in fact they are visiting the “Welcome!” page and being redirected to the membership page again. Provide clear navigation options on the membership pages and provide a notice such as “Do not click the back button”. Add navigation information or other content below the redirect shortcodes on the “Welcome!” page. This will help customers redirected to that page who do not have one of the membership levels in your shortcodes. What's the suggestion if you host 2 or more programs on one site (with one login)?